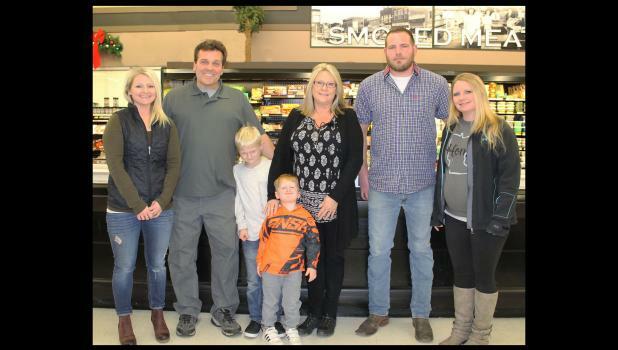 Tim and Jodi Dittes and their family visited Springfield last Wednesday evening during our community’s annual holiday open house, and they spent several hours meeting people and getting better acquainted with their newest store and the Springfield community. It was a good feeling to see all the lights, all the cars, the streets bustling with people and activity, said Jodi Dittes. The Ditteses have purchased Jim’s Market from Paul Huber and will assume ownership and management of the store Monday, Nov. 26. The family has been in the small town grocery business since 1977, when Tim’s father, Don, purchased a grocery store in Fulda. Tim has worked in the family grocery store since the age of 15. The Ditteses, who reside in Appleton, operate grocery stores in Laurens, Sac City and Ida Grove, Iowa, and Dawson, Richmond, Appleton, …. and now Springfield. The Ditteses chose to buy the Springfield grocery store, Tim said, because “It’s a good store and the community supports it.” The previous owners — the Tauer family during 75 years of ownership, and Paul Huber of Canby the past two and a half years — have invested in the business. “Reinvesting in the store will allow it to retain its customers and attract new ones,” Tim said. “If you put back in the business, you’re better for it. The Dittes family is dedicated to the grocery business. Jodi is business manager/bookkeeper. Their daughter, Jourdan Erickson, manages the Appleton store. She represents the family’s third generation in the business. The Ditteses nephew, Dylan Dittes, is also employed in the business. “You’ll probably see them here in the Springfield store periodically,” Tim noted. They have received a warm welcome from local businesses and the store’s staff. The local store will be named Springfield Market. The store will continue to be associated with SuperValu foods network and supply chain, and will retain the current staff. The change in ownership and management will take place Monday, Nov. 26. The store will be closed Monday morning when a crew will be taking store inventory.